Even if you're wandering aimlessly around Valletta, taking in the sights, you cannot fail but be impressed by the many beautiful buildings. Almost all feature covered balconies and many colourful wooden shutters. There are impressive porticos and ornate friezes created by master craftsmen of earlier centuries. The Knights of St John built the original auberges which were inns to house the more lowly knights of the various nationalities. There were originally seven auberges for the eight nationalities represented. 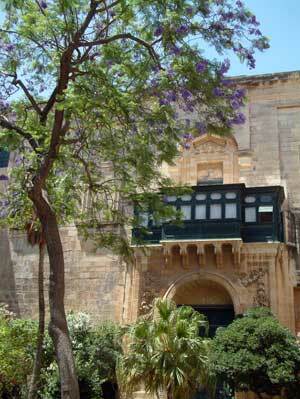 The most impressive is the Auberge de Castille, now used as the Parliament building. Early architectural influences have come from nearby Italy (16th century Baroque style), later Greek and neo-classical followed by modernist 20th century. Flowering trees and shrubs often soften the outlines. Some of the many memorials in Valletta are also examples of beautiful buildings, such as the Seige Bell Memorial overlooking the Grand Harbour and the Greek Temple in the Lower Barrakka Gardens. Churches across Malta are impressive. St John's Co-Cathedral in Valletta is absolutely exquisite inside.